Fortunately, just a few simple updates to your kitchen can maximize cabinet space, improve workflow, and make spending time in your kitchen a joy again. Drawers are a problem waiting to happen in many kitchens. Even if it starts out as the “just silverware” drawer, we all know how easy it is to start filling it with ladles, spatulas, whisks, and more. The good news is, if you have dividers to keep drawer contents separate, filling up your drawers with whatever you like is A-okay. We suggest keeping everything in place with high-quality drawer inserts by Fineline™. 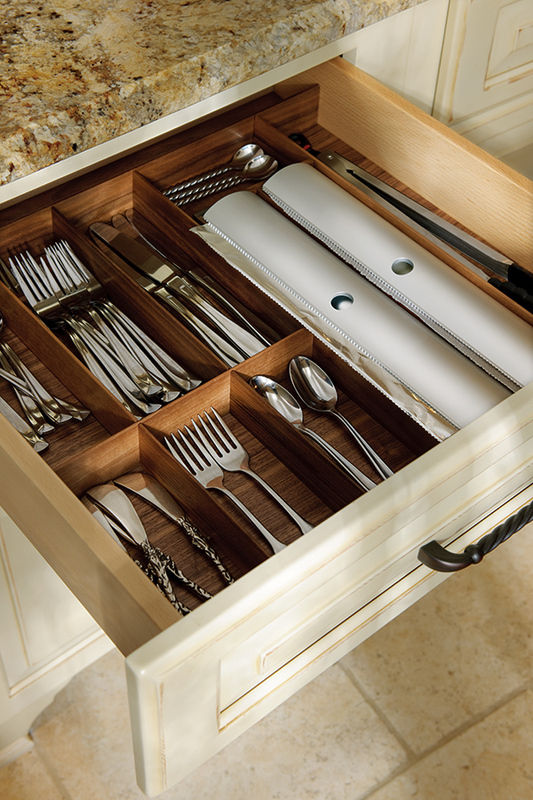 Fineline™ drawer inserts are made of fine walnut and are razor thin to maximize usable space. Many of the inserts can be cut to size and moved around according to your needs. At Plain & Fancy, our customers can choose from a walnut or maple natural finish. Forget keeping your garbage in plain sight. Stand-alone garbage cans get dirty fast, and they often smell. A better idea is to hide the unsightly garbage where it won’t be seen until you need it. Our suggestion? The waste bin pull out. 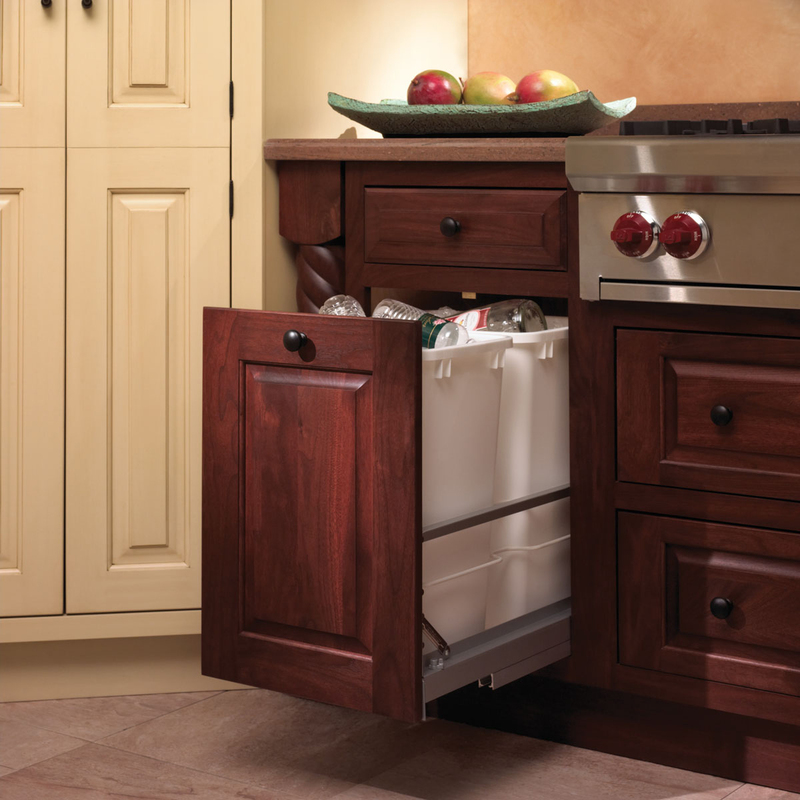 A waste bin pull out or pull-out trash can is a trash bin that slides out of your bottom cabinets like a drawer. The front of the bin looks like any other kitchen cabinet door, but it’s a trick of the eye as this one simply slides out perpendicularly to the face of your cabinets. Plain & Fancy offers many options for waste bin pull outs, including pull-outs with wire brackets or those with wooden brackets. We have various sizes to meet your needs, and you can choose from a single or a double bin set-up. Depending on how you typically divide refuse and organize your recycling, a double bin can be handy for cardboard, paper, metal, plastic, and/or glass recyclables. Corner cabinets are notoriously challenging when it comes to access and storage. Their openings are much smaller than their overall area. Inside, it’s usually dark and, therefore, difficult to see into. And reaching in to pull something out can mean you’re practically crawling inside. Fortunately, we’ve got three corner cabinet solutions that can make your access and storage in these tight spaces just as convenient as in the rest of your kitchen. 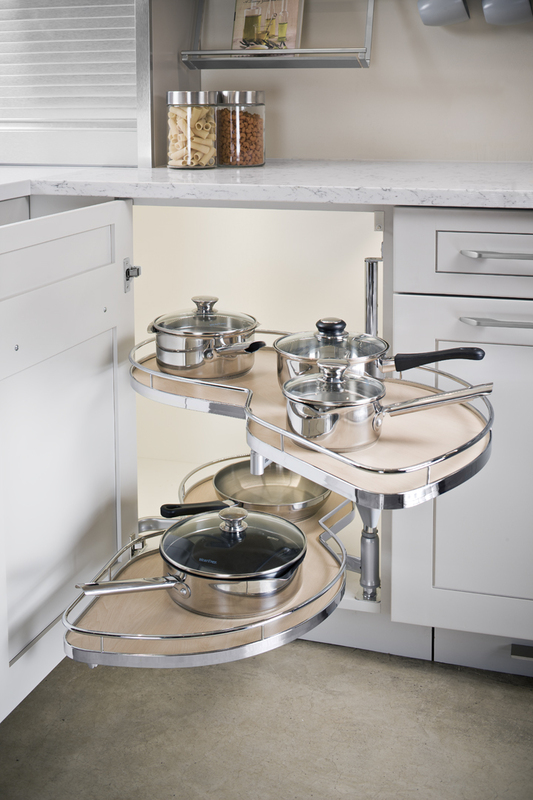 Likely the most classic solution to the corner cabinet problem, a Lazy Susan is a revolving, circular tray that allows you to turn and see everything sitting on it. Still, most corner cupboard Lazy Susans waste a lot of space on the periphery of the trays. Plus, it’s easy to pinch your fingers between the door and the cabinet base. Good thing we’re not talking about this kind of Lazy Susan. That was your grandmother’s Lazy Susan. We’re talking about the Lazy Susan Q. This Lazy Susan makes every corner of your corner kitchen cabinets useful thanks to the updated technology and space-saving features. First, as soon as you open the Lazy Susan Q, you’ll see that the two doors fold and disappear around the back of the tray, instead of turning statically and wasting space. Get what you want from the turning shelves, and a simple spin puts the doors right back into place. 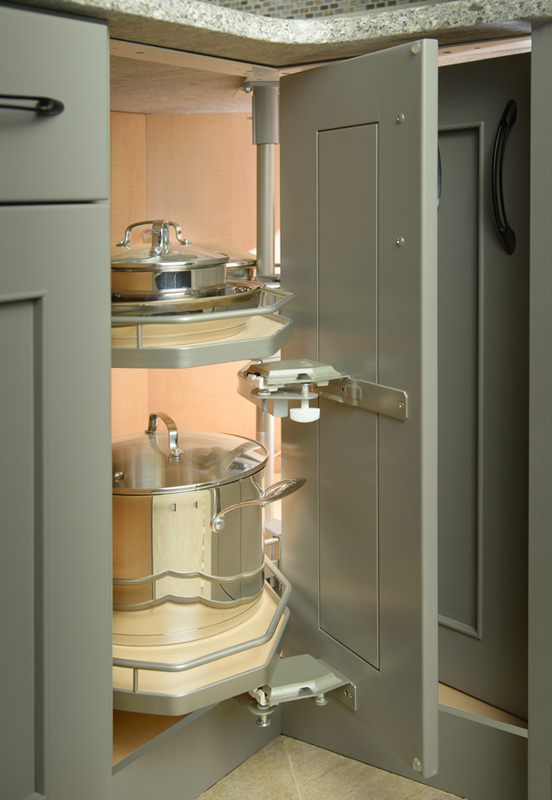 The Lazy Susan Q also features advanced technology to keep fingers from being pinched, easy silent movement, soft closing doors, LED lighting, and several color options. The Magic Corner takes accessible storage to a whole new level. When you open a corner cabinet with Magic Corner technology, everything inside the cabinet comes into full view within seconds. This is achieved when the front baskets, closely followed by the rear baskets, travel along with the door and entirely outside of the cupboard as you open it. You’re essentially pulling out the entire shelving unit in one, fluid movement. Everything inside ends up easy to see and pick through. There's no need to get on your hands and knees to dig. When you’re done, simply guide the baskets back into the cupboard with one more easy movement. Finally, we come to the Dead Corner Unit from Lemans. This unit is similar to the Magic Corner in that it brings the entire contents of the cabinet out for easy access; however, instead of separate baskets, there are two trays: One on the top and one on the bottom. These durable trays are uniquely shaped to swing easily and smoothly out of the corner cabinet and into full view. Pull out whichever tray you need at the moment; they each move separately, unlike the Magic Corner, which moves as a single unit. 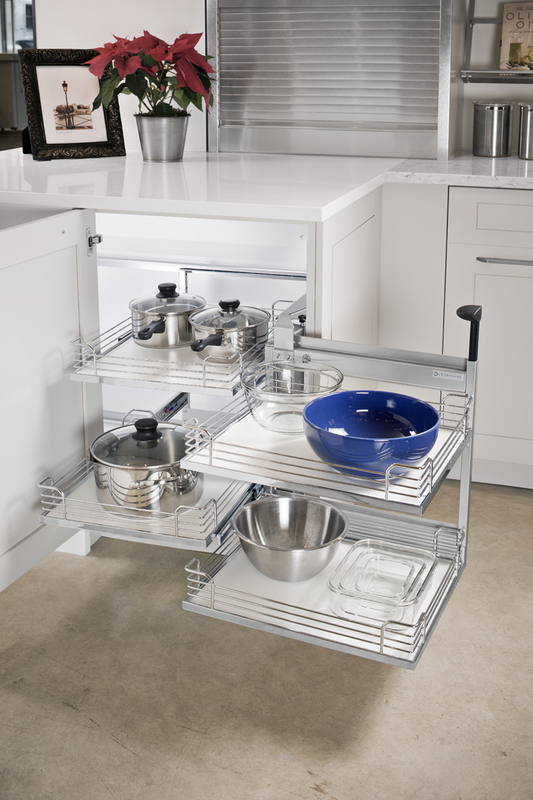 The Lemans Dead Corner Unit is an ideal way to optimize corner cabinet access and is our #1 corner storage solution! Thanks to these clever kitchen cabinet features, you’ll be able to maximize kitchen cabinet space and make it more enjoyable to spend time in your kitchen. Plain & Fancy has everything you’ll need to get started. For over 50 years, our family-run business has been the leading name in kitchen cabinet design and installation. For a design consultation of your own or to peruse our many cabinet styles and feature options, visit our Design Center in Schaefferstown. Not in Pennsylvania? Go here to find a showroom in your area.